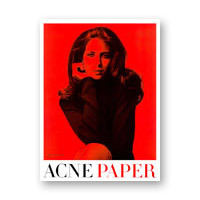 Design agency ACNE is starting their own magazine called Acne Paper. The first issue features a 38 pages fashion report with clothes from Acne, photographed by Peter Gehrke. There's also interviews with Marie Chaix from Self service, the artist Jonny Wooster and Kitsunés and Daft Punks Gildas Loaec and a series of portraits of Swedish artists photographed by John Scarisbrick. The magazine will be published twice a year in A3 format and distributed internationally at the cost of 4 euro. More info at Resumé (in Swedish only).